Did you know that oral cancer steals the life of one American every hour? We don't hear much about oral cancer, but 35,000 patients are diagnosed each year. Only half of patients diagnosed with oral cancer will survive longer than five years. Because it is often detected in the later stages, oral cancer's mortality rate is higher than that of cervical cancer, Hodgkins disease, brain, liver, kidney, or ovarian cancer. Treatment for oral cancer often causes disfiguration and lessens the patient’s quality of life. 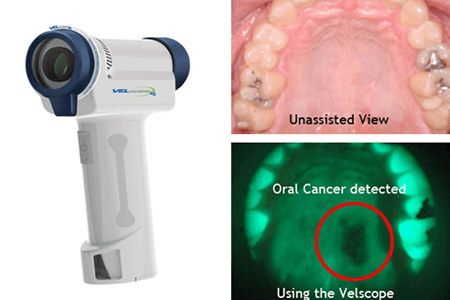 Thanks to an amazing new technology (VELscope), dentists and hygienists can quickly and painlessly screen for oral cancer. VELscope is an identification and marking system that detects tissue abnormalities and is used in combination with traditional visual exams. This exam is akin to a pap smear for women or a PSA screening for men but much faster and easier. It should be done yearly and can save your life. All adults should have an annual VELscope exam because a quarter of oral cancer victims are non-smokers, don't drink, and have no lifestyle factors to heighten their oral cancer risk. Men over 40 are the most prone to the disease, although the number of women with oral cancer has risen in recent years due to the increased number of women smokers. Patients with lifestyle risks, including any tobacco use, daily alcohol consumption, viral infections, autoimmune deficiencies like HIV, and diabetes, may need more frequent evaluations. Unlike other devices used for oral screening, VELscope does not require any dyes or prolonged testing procedures. In fact, the VELscope screening takes about two minutes and can be performed in the office during a routine hygiene exam (and under normal lighting conditions). While all of this information sounds disheartening, if oral cancer is found and treated in the early stages the condition has an 80 to 90% cure rate!